In her second non-fiction title in less than two years, Vancouver author Marilee Peters examines remarkable waterways and their influence on great moments in history. Peters’ talent is her ability to marry information and story. 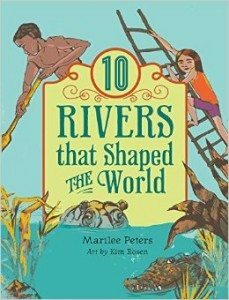 In each chapter, the author plucks a character from history and creates a well-researched yarn about how important a particular river was to the person’s life. For instance, we meet a young, anxious Louis Armstrong before his first gig playing trumpet on a Mississippi riverboat, an event that ultimately altered the direction of music. Readers learn how every river has the power to change its course – and that of human history. Rivers persist even as the people around them change. These bodies of water have shaped technology and civilization while also influencing wars, famines, and the creation of taxes. Peters creates vivid portraits of life on the riverbanks, including the threats posed by rising waterlines, catastrophic floods, and robber barons. Budding anthropologists will enjoy learning about Lucy and the “missing link.” Archaeologists and geologists in training will be fascinated by the fossil talk and discussion of the millions of years of history contained underwater. And tinkerers will find their interest piqued by the examination of early engineering. Featuring American artist and designer Kim Rosen’s expressive illustrations, the book is beautiful and substantial. The design nimbly incorporates landscape images, archival photographs, inspired water-drop splashes, and flourishes to great effect. Overall, 10 Rivers is a great resource to spark discussion and spur further educational opportunities.